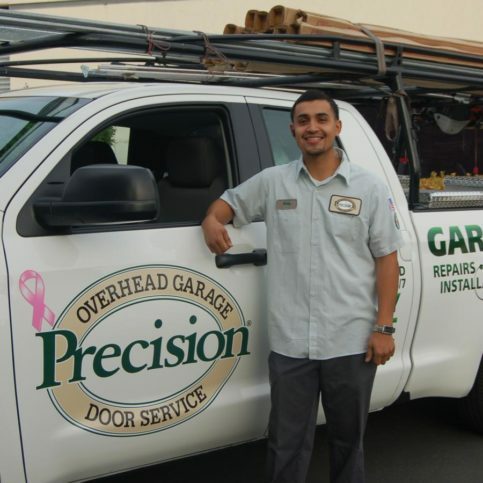 Precision Door Services of the Bay Area installs and repairs all types of garage doors for residential clients throughout the Bay Area. 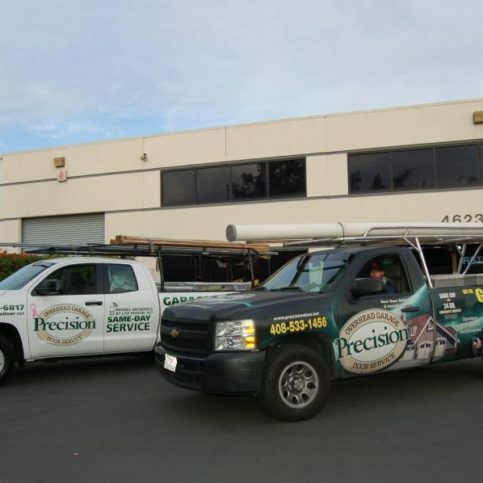 Precision offers same-day repair service, guarantees each call will be answered by a live person 24/7, and is open seven days a week and on holidays. The local, family-owned and operated company also offers a large selection of garage doors for sale, including carriage house and custom wood styles. 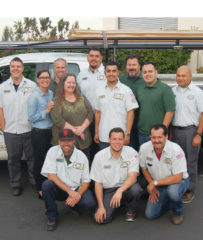 Precision Door Services of the Bay Area’s staff focuses on providing outstanding customer service. 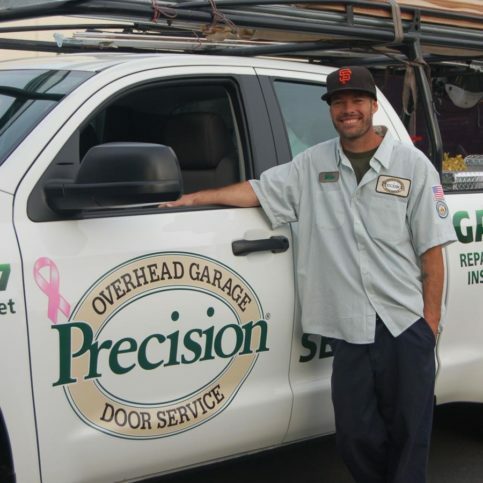 Precision Door Services of the Bay Area has been installing and repairing garage doors for residential clients throughout the Bay Area since 2001. 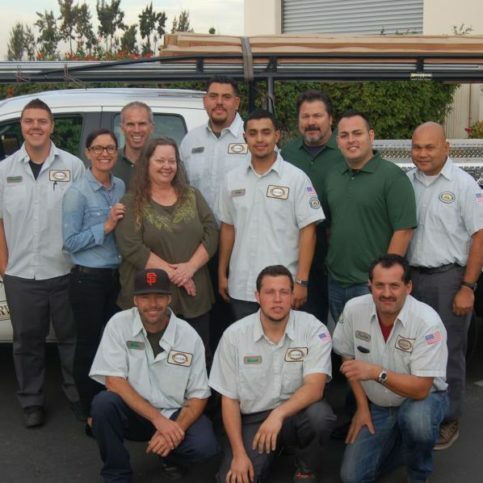 The family-owned and operated company offers a large selection of garage doors for sale (including carriage house and custom wood styles), and it provides same-day repair services for the convenience of its customers. If you want to make your home quieter, consider making modifications to your garage door. Most people don’t even think about the noises their garage doors make. However, if you have a living space above your garage, neighbors in close proximity or varied sleep schedules within your household, you’re likely to discover just how disturbing loud garage door noises can be. Look for loose bolts and screws and tighten them so they’re snug (be careful not to over-tighten). This will stop the door from rattling when it opens and closes. Replace worn or damaged hinges—they can make the whole door loose and cause vibrations, rattling, and grinding noises when you open or close it. Lubricate the track, springs, rollers, chains and other moving parts of your garage door. Keeping these areas lubricated will cut down on noisy vibrations and keep the moving parts functioning more smoothly. This should be done every six months, or when you notice your garage door getting louder. Garage door silencers and soundproofing kits are also available. These kits stop vibrations from traveling through the garage roof to the rooms above. Q: How quickly can you come to my house and fix my door? A: We can usually get to you the same day if you call before 4pm. 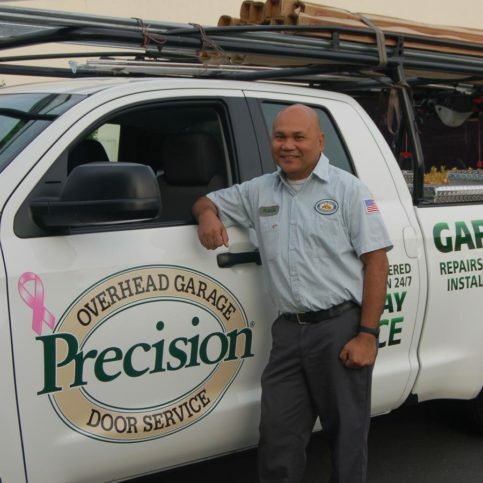 We understand that a broken or malfunctioning garage door can be a big problem, so we always try to get to our customers as soon as possible. Q: How much will it cost to repair my garage door? A: Our technician will give you an estimate before starting any work. It depends on a lot of factors, so we prefer to look at the problem before we give an estimate so we know exactly what we’re dealing with. Our estimates include the full installation cost, so there are no hidden fees, and we also include an inspection of the garage door. Q: What door brands do you service and install? 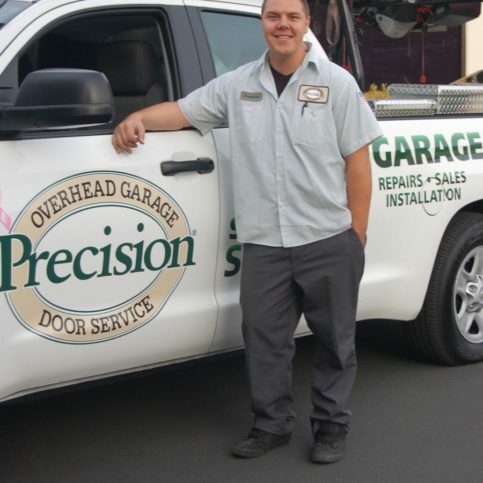 A: We service all major brands of garage doors and garage door openers. We install Amarr, Chamberlain, Clopay, Entrematic, Genie and LiftMaster doors. Q: Why should I consider an insulated garage door? A: Insulated garage doors are much quieter than traditional doors, which is important if there’s a bedroom above your garage or if you have neighbors who live close by and might be disturbed by loud noises. Q: Do garage door rollers really make a difference? A: Yes. There are two types of garage door rollers: nylon and plastic. Nylon rollers are usually white, and they’re quieter and more durable than plastic rollers, which tend to be black. Situated at about ankle height on either side of the door, the safety sensors protect against door-related injury and damage. Either sensor has an “eye,” which enables it to transmit a signal to the other. In order for the door to function properly, these two eyes need to be in alignment. If communication between them is interrupted, the garage door won’t close. There are a couple things that can cause the safety sensors to malfunction. One is if something is blocking the transmission between the two eyes. Many times, the cause is obvious; however, even something as insignificant as a spider web can interrupt the signal, so be sure to look closely when checking for obstructions. The other possibility is that the sensor eyes are out of contact with each other. Either sensor has a green light; if the light is solid, you know the sensors are in alignment. If the light is blinking (and there are no obstructions), try readjusting one or both sensors until the light is solid on both sides. 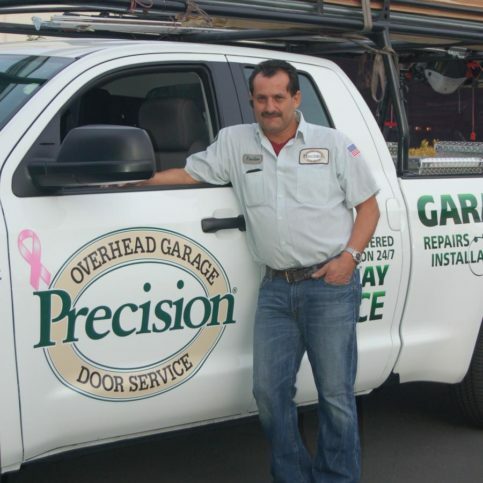 Diamond Certified Expert Contributor, Pat Prendergast: Today we want to give you a tip on how to potentially fix your own garage door problem, which may be just the censor eyes, which you can line up yourself. If your door won’t go down, then it’s possible that it’s just the sensor eyes and you can fix it yourself. If your door won’t go up, you probably need a professional to come out and help you fix your door. But you can see here there’s a green light and it’s solid, and if they’re both solid on either side, that means the two lights are meeting each other and it’s safe for the door to go down. Often people think that both lights have to be green, that’s not true. They both have to be solid, generally, depending upon the opener and the sensor eyes used. So if something’s in the way, you can see that the light will go out, because it thinks that there is something in the way and therefore the door should not go down as a safety precaution. As I take my hand away, you can see the solid green light comes off. Lots of things can cause the safety eyes to not see each other. Sometimes people will inadvertently hit them, and therefore they won’t be lined up. Sometimes there’s cobwebs or dirt that grows over time so it thinks that there’s something in the way, or sometimes there actually is something in the way, as you can see when I put this in the way of the sensor eye it turns off. Diamond Certified Expert Contributor, Amie Prendergast: Another way to check to see if it’s your sensor eyes that are the issue is to try closing your garage door. If the light is blinking and it’s making a clicking noise, it most likely is your sensor eyes. So you can save yourself some time and money by checking your sensor eyes before calling us. 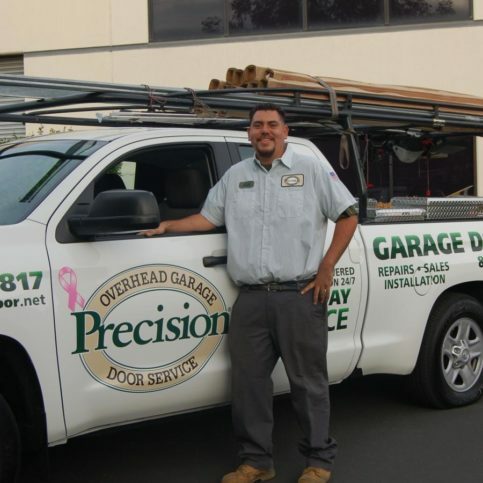 Pat Prendergast is president of Precision Door Services of the Bay Area, a Diamond Certified company. He can be reached at (408) 389-5057 or by email. A: A cat person. We have a cat named Max. A: Chez Panisse in Berkeley. A: Play a game or watch a movie with my family. 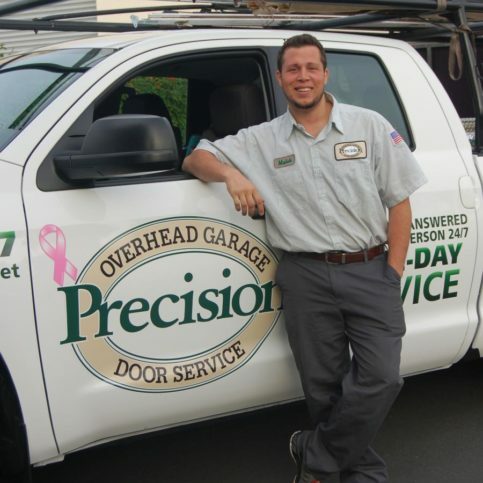 Precision Door Services of the Bay Area : Average 9.0 out of 10 based on 144 unique customer surveys of customer satisfaction. The guy figured out what was wrong, he cleaned up after himself, and he taught us some best practices for taking care of the springs. He was great. He didn't get too technical and didn't make me feel dumb, but was still a complete professional. He was great. They were done quick and they took care of everything. Their prices are reliable and the product lasts for years and years. It works. Every time I use the garage, the door works great. I thought they did a great job, very straight forward, no surprises. They have been more inclined to help us than any other contractors that we use. They are willing to help us when we need them. They did a good job. I don't think there is much to say. I liked the man who came out to take a look at everything. He was very confident that they would be able to help get things back to normal, which they did. It was a great experience. It was really easy to use them. Nothing that I can think of specifically, just overall, they were great. They were good and the quality of work was excellent. I thought they were good. They made it very simple for us. They were easy to contact. They showed up. Best prices, and they did an excellent job. They made the house look really nice. Well, their prices really draw you in. If money isn't a problem, they are great. They came out quickly and were friendly. I thought they had a pretty good product and service. They were professional and did what they said they would do. They gave me a fair price. They were able to get me a garage door fairly quickly. They are reliable and on time. Clean operation, personable, and got the job done, they were professional as well. Well, we called, they came, and they got the door working again. We called and they came out. Our garage door can open again. I don't know. Our garage door works again. I thought using them was a breeze. They were really knowledgeable and respected our home, which was expected. They were good. I liked the technician's that came out to fix the garage door.